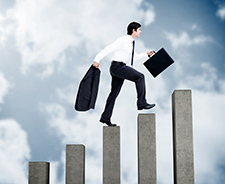 For many, earning a leadership position requires a climb up the corporate ladder. But what do you do when there’s no clear ladder in sight? When it comes to accomplishing a long-term goal, you must have a plan. Start by figuring out your ultimate goal. Do you want to own your own company? Become a manager? A partner in a firm? Whatever it may be, write your goal down, then make a list of everything you need to do to achieve it. Divide your list into manageable segments, like education, experience, and skills. By breaking one long-term goal into smaller, easily obtainable goals, your career dreams may become more realistic. Even if your current workplace doesn’t provide room to move up, having—and following—a plan will help you make targeted movements along your career path. To find work in specialized fields, you likely need to be educated in those industries and possess the skills companies look for in employees. But, education doesn’t stop when you graduate high school, earn your college diploma, or finish your certification. In fact, employers often look highly upon employees who take the initiative to further educate themselves. This doesn’t mean you have to enroll in a traditional 4-year college program. Instead, check out your local resources for educational opportunities. Your city may have a community college that offers individual classes on computer programs, communication, or other specialized skills for your job. Likewise, your industry may have an employee association you can join. Those associations usually have resources available to members, including networking opportunities, webinars, and newsletters. Have you heard the famous phrase: “It’s not what you know, it’s who you know”? It’s a reminder of the importance of networking and meeting people who may be able to help you on your career path. When it comes to advancing your career or moving into a leadership role where there may not be a clear path for you, it’s especially important to focus on networking. Consider, for example, that you attend an association event filled with industry colleagues and executives. Through networking, you meet someone with whom you share a story about your experience. The skills you have are a perfect fit for a leadership role at this person’s company, but you may not have known that had you not attended the event. Likewise, if you earn a new certification and add it to your LinkedIn profile, it may get you noticed by someone in your company who didn’t know you possessed the skills or motivations that you have. It goes without saying that you must work hard to advance your career, right? But when there isn’t room for advancement in your workplace, it’s especially important to excel in your role. When you have the opportunity to go the extra mile, take it. If your supervisor needs someone to volunteer as the lead on a project, and your schedule allows for it, raise your hand. If you would like to try something new, ask about it. Supervisors notice the employees who work hard, and if you want to advance your career, you must first be noticed. While working hard is essential to getting noticed by leaders in the company, so is being an initiator. Supervisors are busy, so if you notice something that could be done more efficiently in your everyday work, or you recognize a place where the company could save money, find time to present your findings to them. Chances are, your unique position allows you to recognize problems or deliver solutions better than anyone else. Not only can your suggestions benefit the company, they can also show that you have strong initiative. When someone sends you an email thanking you for superior service or congratulates you on an accomplishment, hang onto those emails. Consider creating a folder in your inbox or on your computer where you can keep notes of positivity from others. Not only will this folder serve as a quick way to boost your spirits, it can also show your supervisor how you’ve helped others. When you have a performance review or want to discuss the opportunity to advance in your role, use the documents in your folder to support you. We all like to feel appreciated. And while it may be nice to receive the promotion, pay raise, or advancement you’ve set your sights on, it’s important to say thanks to those who help you on every step of your career path. After all, thankfulness and positivity are traits of strong leaders. How do you move forward with your career, even when there isn’t a clear path for advancement? Let us know in the comments section below! Previous Post Poll Results: How Do You Track Your Goals?